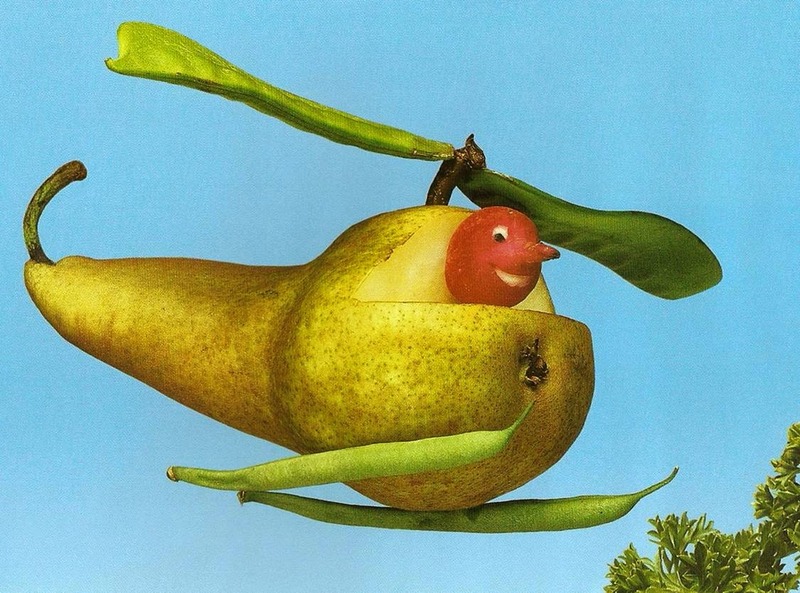 Saxton Freymann & Joost Elfers have done a bunch of books with photographs of fruits and vegetables put together to look like people, animals, and other stuff. 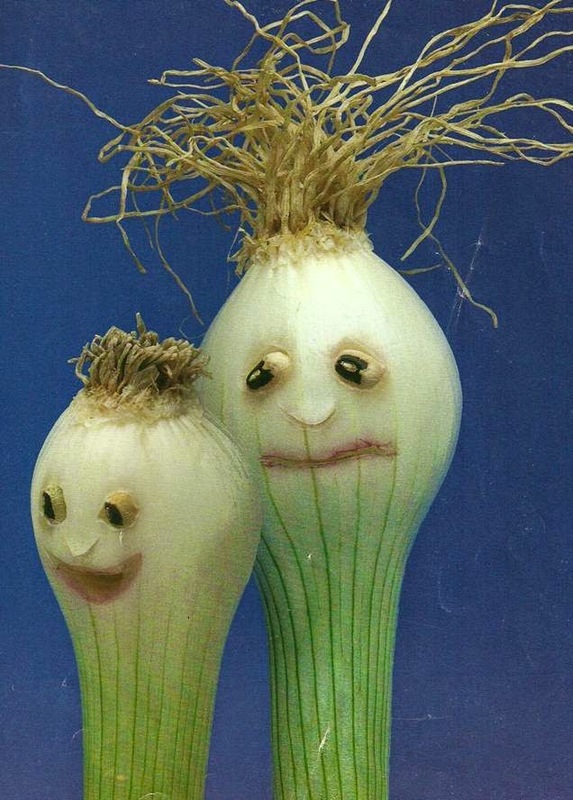 They're really amazingly creative and kids love to look at them. We've used them more than once for our "Food in Fact and Fiction" K-2 Book Adventures program, putting scanned photos into a slide show that we ran with musical accompaniment. Later, we used an adapted version of that in Family Storytime. I decided to give it a try in Toddler Time, but there's just one thing: we never, ever do anything in Toddler Time that puts the pages of a book on the screen. Although I've really enjoyed our creative uses of the screen with stories for older kids, we're not going there with 1's and 2's. 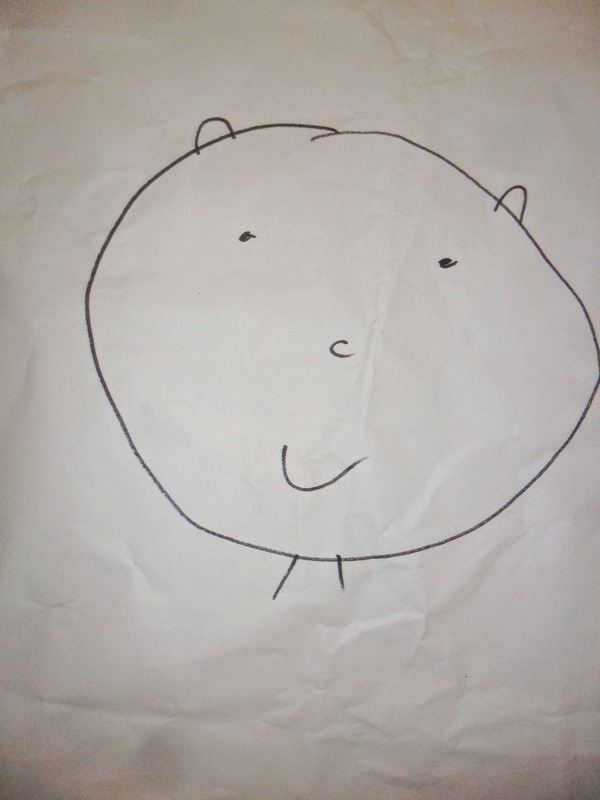 Also, our Toddler Time crowd is small enough (20-25 kids, but they're little) to see pictures pretty well. So my first thought was to play the music and use the book, just doing page turns. That didn't work too well, though, because most of the pages have at least two separate images. Which is great for a book, but in a group presentation you want to be able to focus on one photo at a time. So I decided to enlarge and print out individual pictures, cropping where needed, and show one piece of funny food at a time. 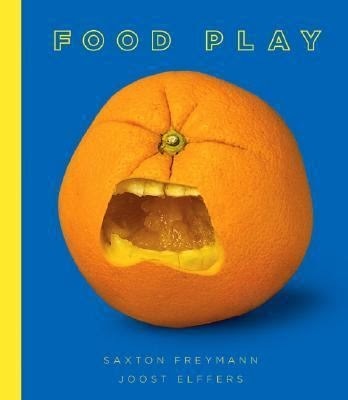 For our earlier presentation, we selected images from a variety of books, but this time I stuck to just one book, Food Play, which actually consists of pictures from several of the other titles, kind of like a "Greatest Hits" collection. It made sense to me anyway, and did help my planning some, so if anyone wants to try the story and would like the line by line, let me know and I can send it. I'd also be glad to list the photos I used, but it's also fun to just pick out your favorites. The song divides neatly into 6 sections, and I picked 4 illustrations for each section, grouping them into similar themes for each section: Faces, Animals, People, Vehicles, More Animals, and Faces again to end. 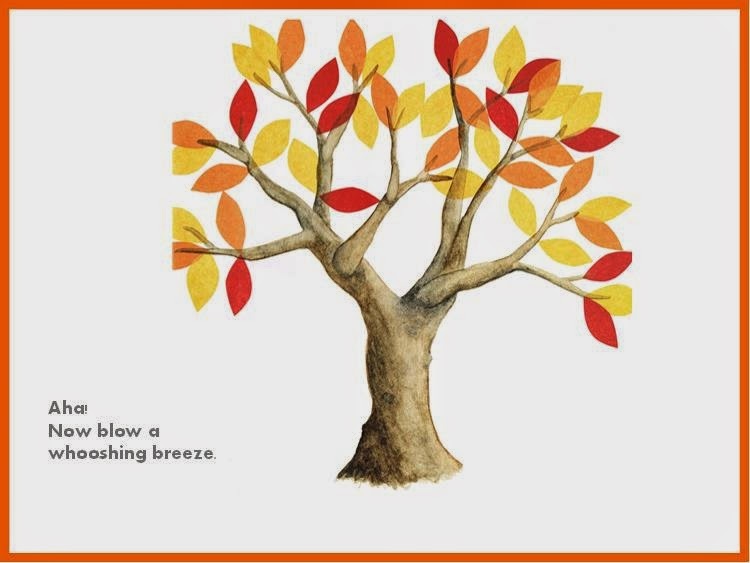 With the slide show, we used more illustrations, switching them faster, because clicking for a new slide is seamless. Also, the toddlers really need more time to absorb what they're seeing. So doing 4 per section means that I held each one up for about 4 or 5 seconds. I thought about putting the images on sticks to make them easier to handle, but just using two hands worked fine. And even though "holding up a picture" sounds simple, Terri pointed out that there should be rhythm and sameness to the appearance of each picture. So I picked up the picture from the stool on my right, slowly panned it from left to right, then slowly went back right to left, and picked up the next one. That regularity meant the kids could focus on the images without having to work to track where the picture will be. This is one where all the work is in the prep. Choosing the illustrations, scanning, printing, and laminating, and practicing to the music. You really want the transitions from one picture to the next to match the rhythm of the music....it could work without that, but it's better with. And then once it's time to tell it, you just put on the music and flip from one picture to the next. The toddlers really enjoyed it, but I'm sure it was on a different level than the preschool or K-2 groups did. 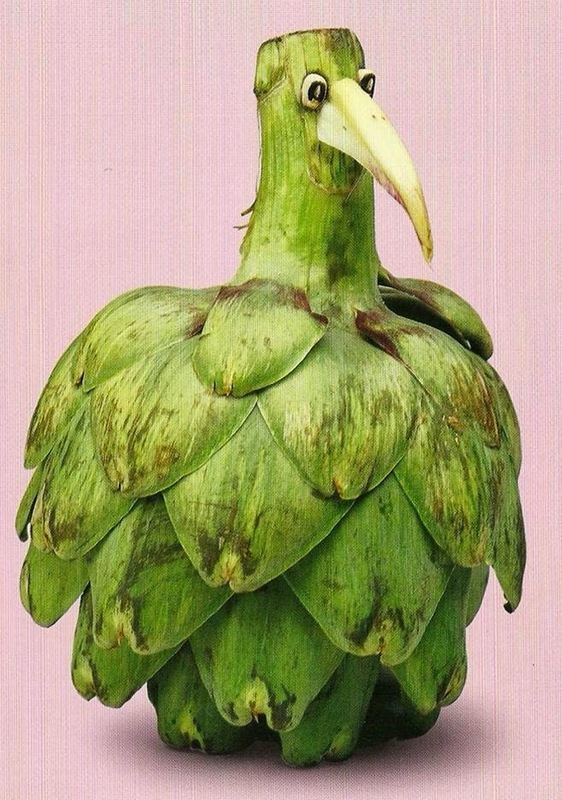 The older kids see bananas that look like giraffes and are amazed at the cleverness; toddlers just see giraffes that look kind of silly...and that's okay. Identifying the fruits is more of a lap activity, and since so many of the Freymann/Jelffers books I had available checked out, I'm sure some of that happens later at home. A couple weeks later I did this same version for a Family Storytime at the Hillsboro Library, where I'm a sub and do a Sunday Storytime a couple times per month. We don't have the screen and projector set-up there, so using the pictures and my ipod worked just fine. The things I was sure to do for Toddlers (fewer pictures, move them slowly and regularly) were equally useful for a mostly 4 and up group, so I really didn't need to change a thing for the older crowd. 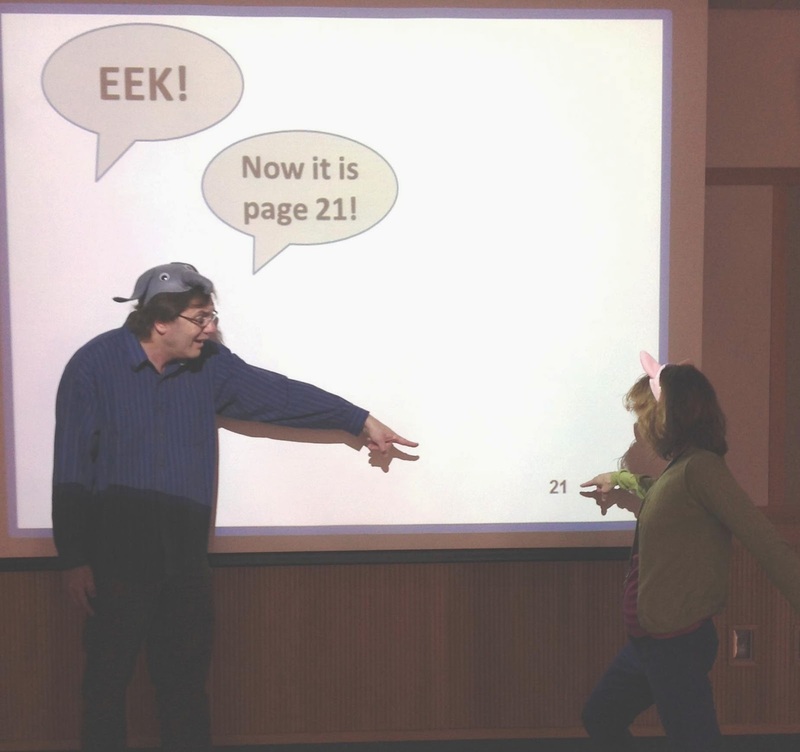 Making books interactive by directly involving readers in the action can be pretty cool: There Are Cats in This Book and Press Here are two of the best examples from recent years. 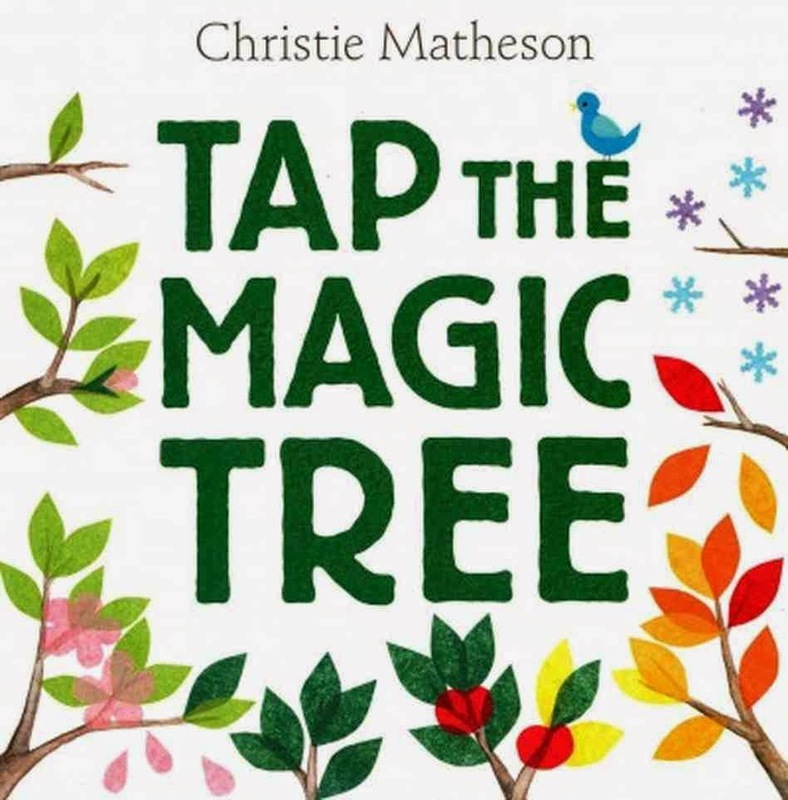 Tap the Magic Tree takes that interactivity used so effectively in Press Here and fits it into a pleasing book about a year in the life of a tree. For Family Storytime, we scanned the images, adjusted the placement of the words a bit, and used the PowerPoint click to work as a "page turn." 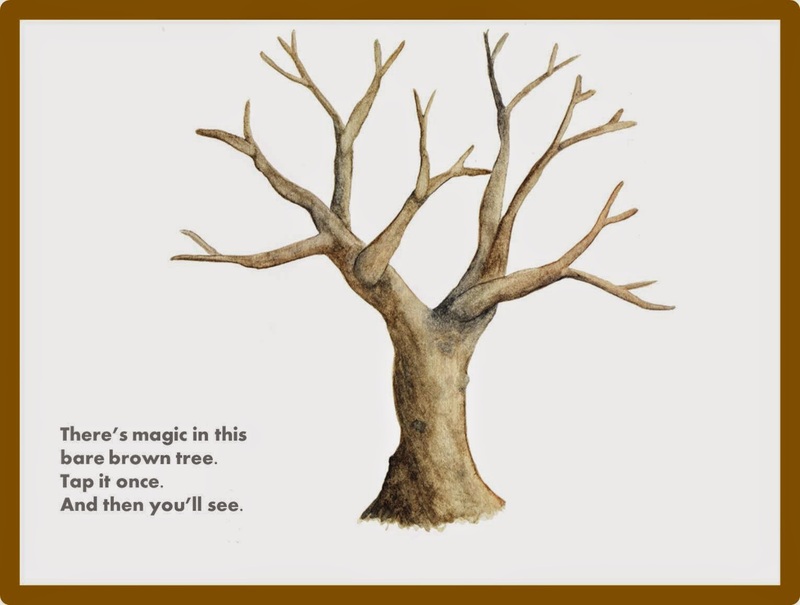 The book opens with a bare-limbed tree. In the book, the words are sometimes on a facing blank page, so we re-typed all of the words to make them appear alongside the image of the tree. By doing the text as a second step, instead of simultaneous to the illustration, we could guide the audience's attention properly. First they see the visual change on the screen. Then the text appears with the instructions that will lead to the next change. The only other adjustment we made from the book was to put a colored frame around each image. Borderless works just fine in the book, but we needed frames to make the pictures distinct against our big white screen. I thought it would be cool to match the color of the frames to a dominant color from the illustration on that page, but I think next time we'll use just one color for the frame so that the change in the illustrations is the only change the audience sees. It's a nice simple book to scan and tell, but with a very effective impact. Our scanned PowerPoint presentation is really not different at all from the way we would read it to a smaller group. I used the book version with my Toddler Time group and it was equally effective, but the scanning allows us to share it with much larger groups. 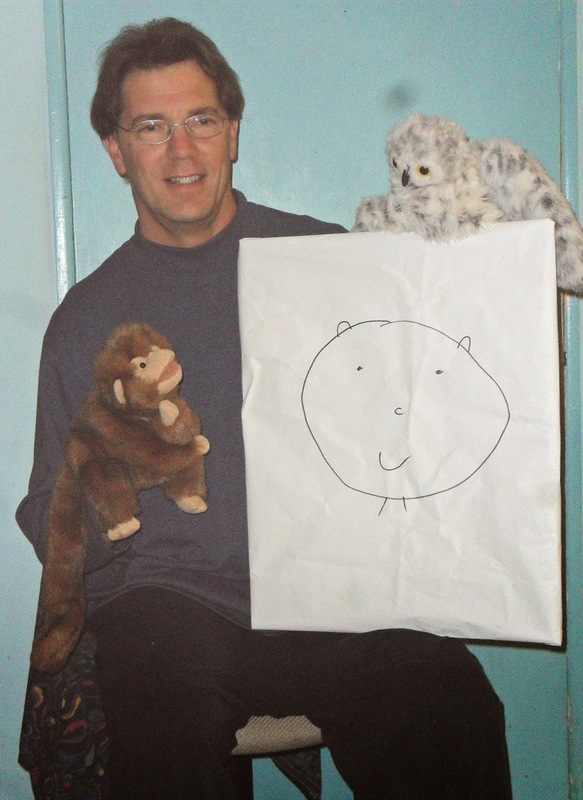 If you're interested in learning more about the puppetry side of this blog, this fall I'm teaching an online course called "Storytelling with Puppets" through the ALSC Online Education Program. Details about the course are here. 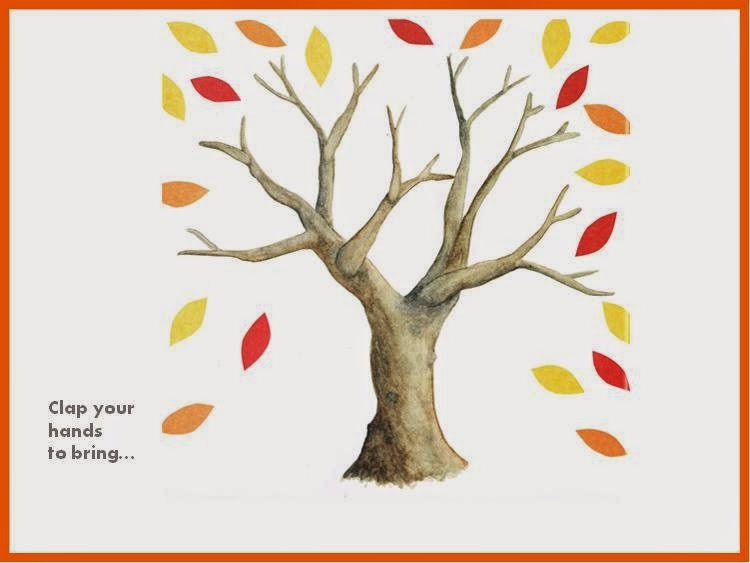 The four-week course starts on the week of September 8th, but you can register now. You register by going to the ALA Online Course Registration Page. It's a "Moodle" course which is run asychroniously, which means you don't have to login to class on certain dates and times, just go through the assignments and participate in forums when it works for you. This is the first time I'm teaching the class, but I think it will be fun. The three main elements will be watching videos of storytelling with puppets, trying out some stories on your own, and sharing what you think and learn online. The "trying out some stories on your own" part is very flexible. You do have to tell in front of an audience, but that audience can be a co-worker, spouse, your own kids....anyone as long as they can give you a bit of feedback. I'm hoping it will be useful to beginners and people who have already spent way too many hours with puppets on their hands. If you have any questions or want to know more about the course, contact me at sengelfried@yahoo.com or add a comment below. 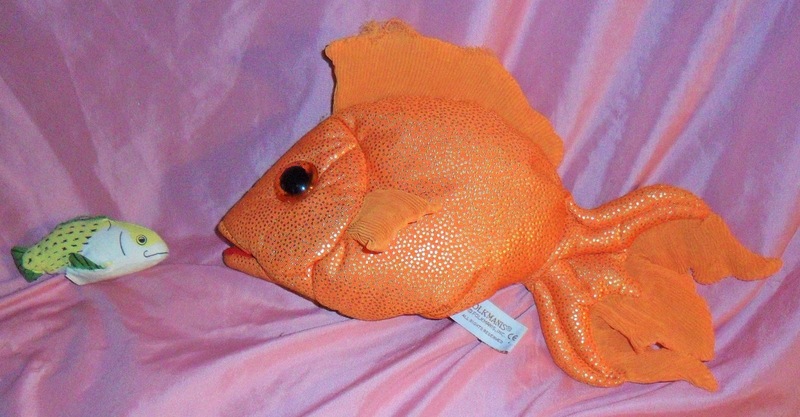 I did The Three Wishes once as a puppet show long ago, when I was just starting. As I remember, I had technical difficulties with the sausage-on-the-nose-of-puppet, so I never tried it again. I think by now I could work out those problems, but for a recent Preschool Stories and Science session, we did it as a two-person Act Out, and that was much easier. Sheila and Terri developed the story, but when Sheila missed a day unexpectedly, I got to step in. Like many folktales, sticking to the bare bones of the story works best with a mostly-preschool audience...and the bare bones are the best parts anyway. Sheila found a nice accordion music clip to use in the beginning. It has a nice folktalish feel. As the Woodcutter, I grabbed my ax and narrated myself into the woods to chop down a tree. Terri was behind our big tree (which we use for so many stories....if you want to make one big cutout prop to help with a lot of different acted out stories, definitely consider a tree). As the Elf, she spoke from behind the tree a couple times just as I was about to chop. Then the puppet popped up and explained that if the Woodcutter spared his home, he would grant three wishes. Sheila added a nice magical entrance sound effect to play when the Elf entered and exited. As I walked away from the tree and back home, Terri walked inconspicuously from behind the tree to behind the home, kind of pretending to be sneaking when it was obvious that everyone could see her. When you don't have trap doors and underground passages (maybe next year's budget?) for seamless transitions, it's fun to let the audience in on it and have them laugh along with you. Once home, the Woodcutter is hungry, so I wished for a sausage. From behind the screen, Terri tossed the sausage over the top. It's just a construction paper creation, attached to a fishing line so she could control the landing onto the table. Sheila had added a spring-y sound effect for the sausage's appearance. Then Terri came out as the Wife, and we went through the back and forth argument about wasted wishes. When she wishes it was stuck to my nose, we click on the sound effect again and up comes the sausage. To attach the sausage to my nose, I just held it there: technical difficulties solved. Our argument continues as the Wife tries to pull the sausage off of the Woodcutter's nose, with some funny tug-of-war/back-and-forth movements, then she picks up that ax and nearly chops it off. In the end, of course, they use the third wish to remove the sausage, and at least have a nice meal to show for it all. We pretend to eat the sausage, the accordion music comes back, and we finish with a final sound effect of a loud burp. That one is optional, but it did get some laughs. When I decided to try adapting Bear Wants More into a puppet story for Toddler Time, I knew I’d have to make some pretty big changes. 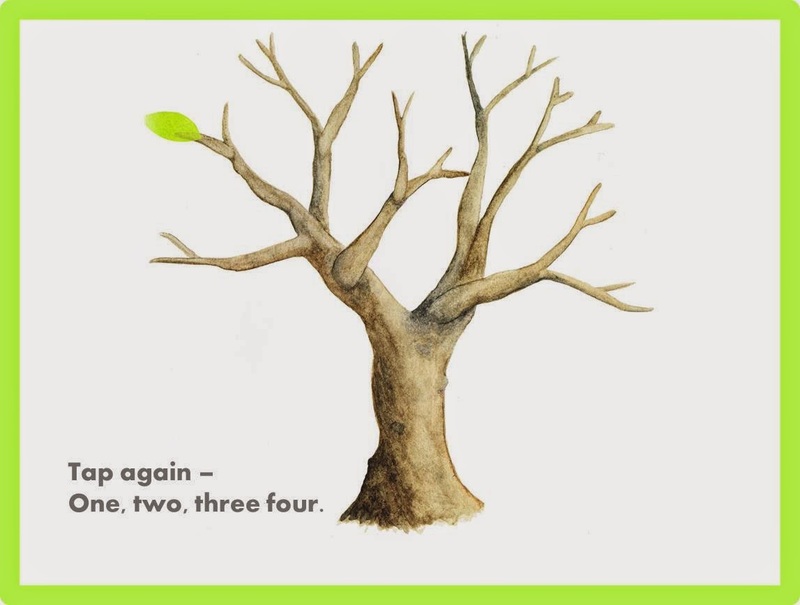 As a picture book it works great, and Karma Wilson does a better than average job of writing rhymes that really flow easily when you read them. My problem was, I wasn’t going to read them, I was going to memorize them, and my memory’s not all that good. So I cut some lines out, simplified some others, and tried not to mangle the author’s flow too much. Here’s a section from the book: “Mouse scampers by with his acorn pail. 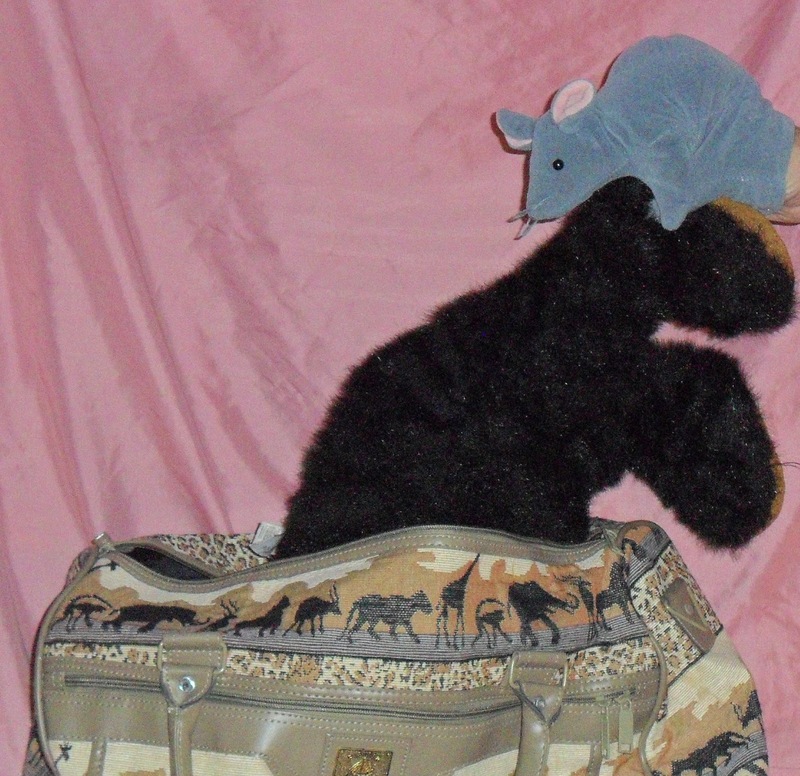 / “Come along,” Mouse squeaks, “to Strawberry Vale!” / So up Mouse hops onto Bear’s big back. 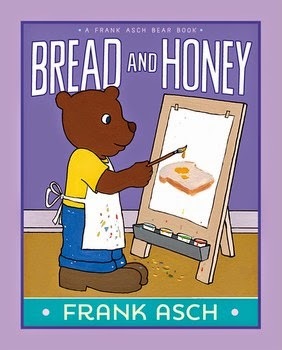 / They tromp through the woods for a fresh fruit snack.” With pictures from the book and a leisurely storytelling pace, the rich language (“scampers… tromp…”), alliteration (“fresh fruit….Bear’s big back…”) and specificity (Strawberry Vale) all work great. 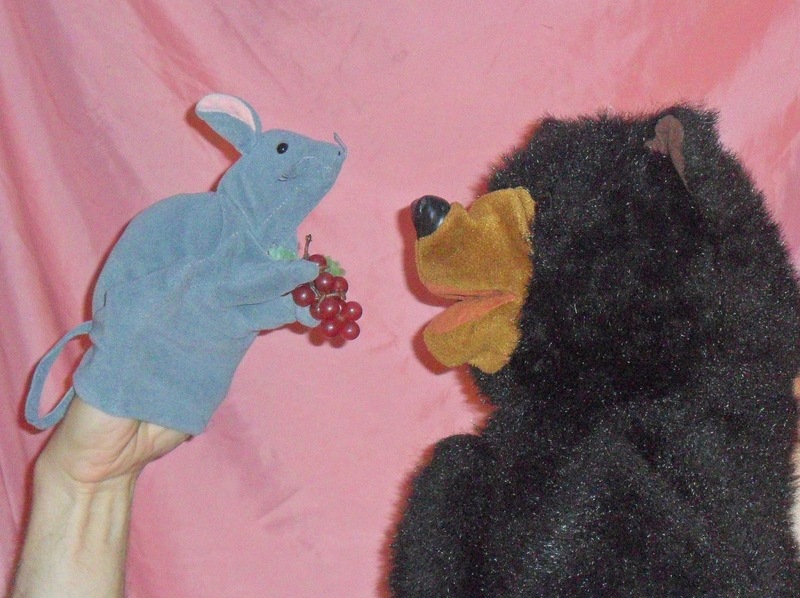 With puppets and toddlers, though, I strip it down to the bare bones: “Mouse scampers by and he’s feeling quite merry / ‘Come along, Bear, let’s find some berries!” No Zolotow Award for that, but it supports the interaction of the puppets, shortens it enough for me to remember, and retains a passable rhyme. 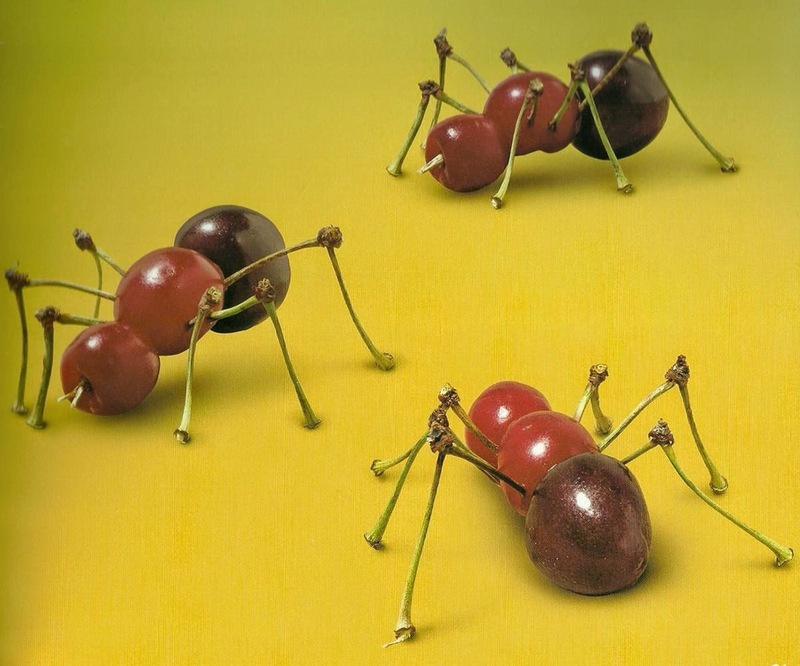 Then we skip straight to: "The berries are sweet / And they eat, eat, eat!" With puppets and a young group, it works better when the words are direct and simple, even if it means losing some of the poetry and flair. I made similar adjustments to other sections, keeping to the original whenever I could. 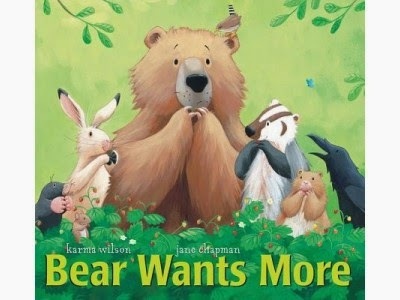 In the book, several of Bear’s friends prepare a surprise party for Bear while he’s gone. 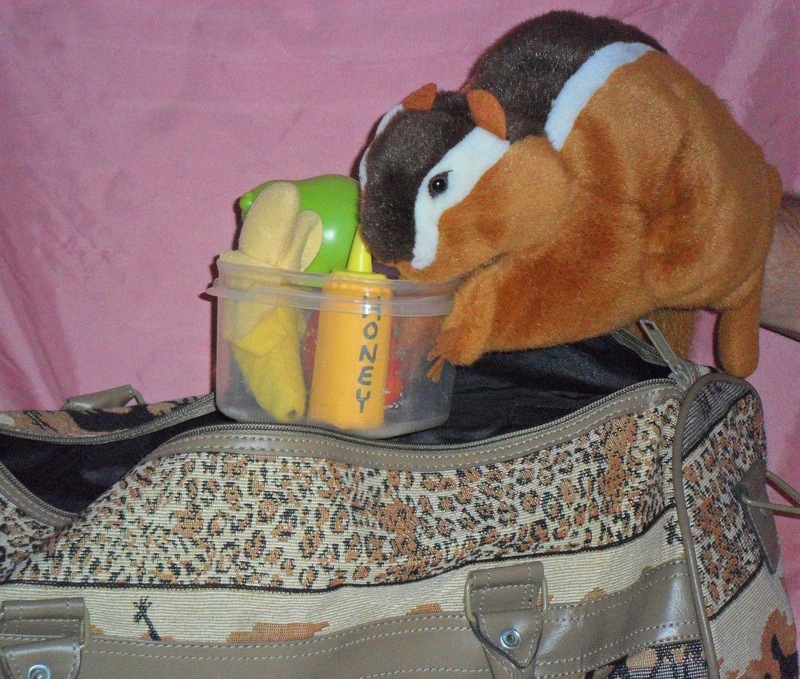 I trimmed that to just one (Chipmunk) and simplified the party description: “She gathers a lot of Bear’s best things to eat / So when he gets back he’ll be in for a treat.” Then Chipmunk puts the food the bag, and I close the zipper a bit. 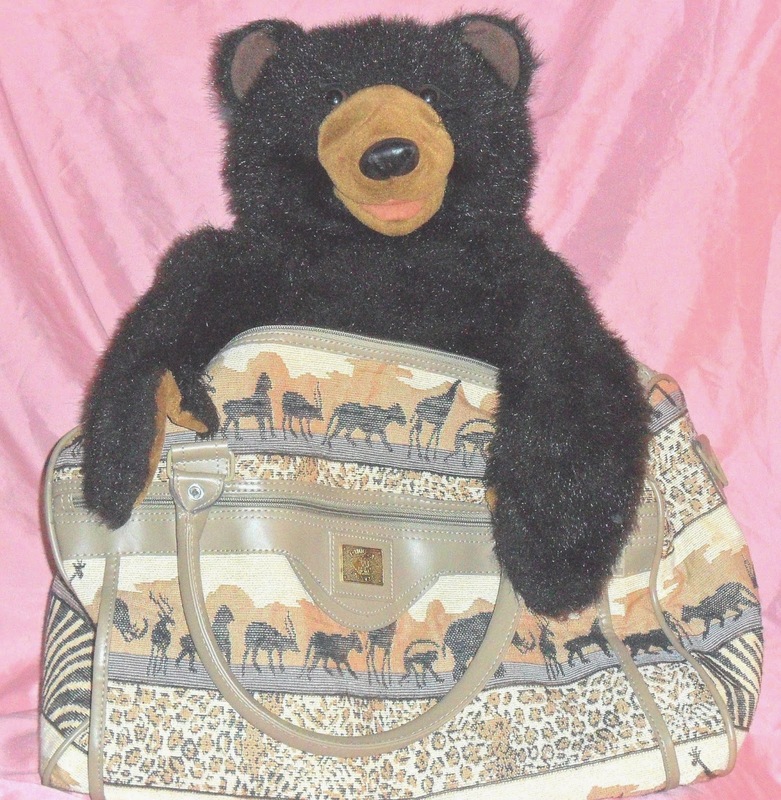 When Bear returns, the words describe that he’s grown bigger: “Bear is so big…that he can’t fit in!” And with the zipper more closed, the kids can see that he really can’t fit, and finally gets stuck. The visual image isn't all that convincing, but the story is so clean and direct that they all got the idea. For that final bit I just grab whichever two puppets are nearest and have them shake their heads atop the sleeping bear. Technology: Sound effects: Fanfare, Tub Filling, Tub Draining, "The Hustle" (or similarly infectious dance hit from the disco era). I post infrequently during summer because I don't typically do many new stories, but I got a chance to try one recently. Our summer Storytime is actually "Preschool Stories & Science," where we do just one story, plus a science demonstration and hands-on craft and science tables. This is usually done by Sheila and Terri, but Shannon and I filled in for them this week. We don't choose stories based on their science content, but it's nice when they have something in common with the activities. This week the kids did bubbles and magic sand, so: a bathtub story! 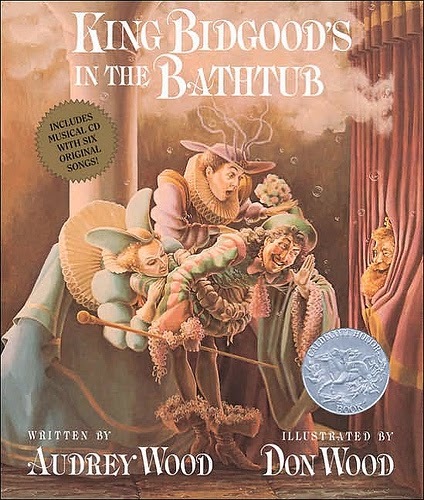 King Bidgood has always been a favorite of mine, but the pictures aren't meant to carry to a storytime audience. So we decided to act it out with some child volunteers and a few sound effects from FreeSound.com. For a tub, we just found some strips of styrofoam we had around for some reason, clipped them together, and put a sign on it. It was the right height for kids to look over and easy to move in and out of, since it was three-sided with an open back. 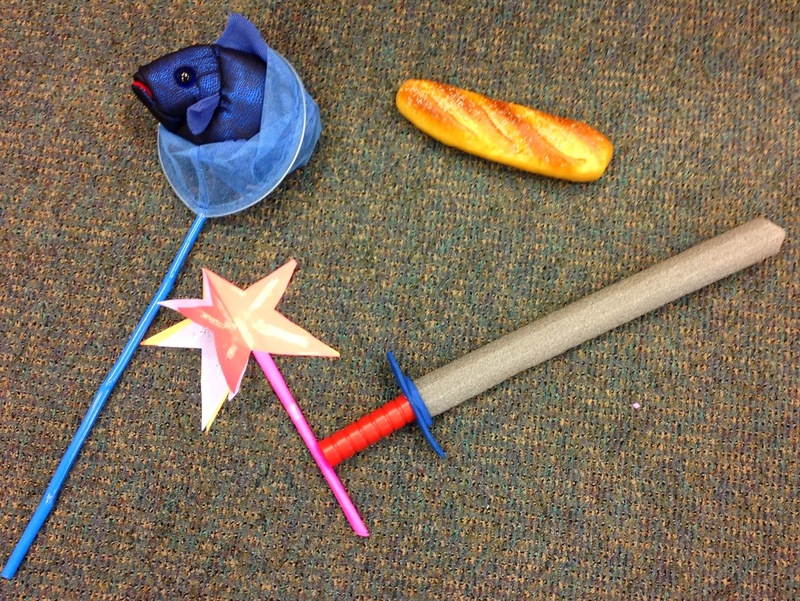 We did change the characters around a bit to match our props and preferences. Shannon was in the tub, so it became "Queen" Bidgood. 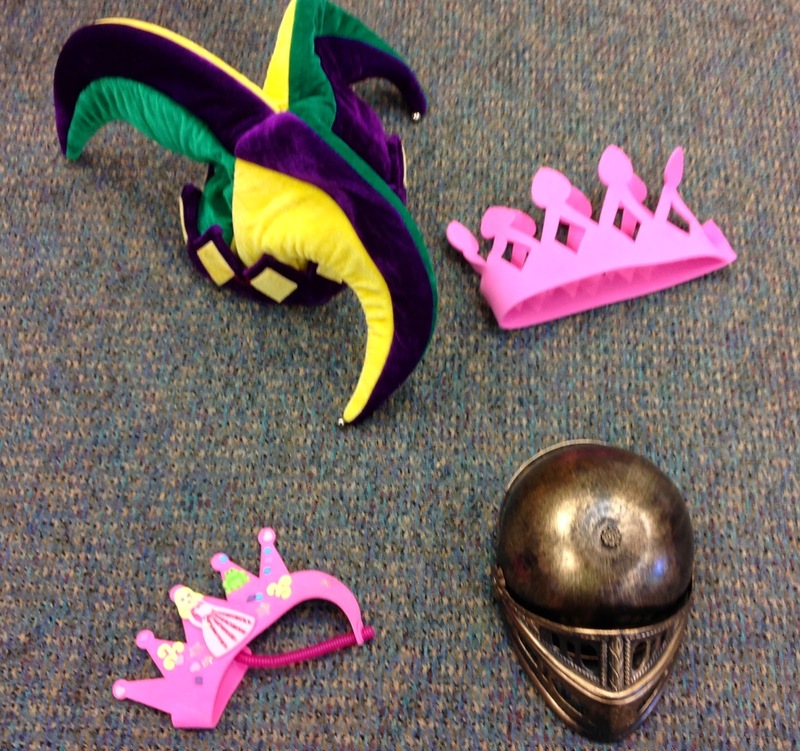 We kept the Knight from the book, but the Queen who lunches became a King (two Queens wouldn't make sense), the Duke who fishes became a Jester (we have a Jester hat; we don't know what a Duke hat looks like), and the Duchess became a Princess (see Duke-to-Jester explanation). As the Page, I called up the four child volunteers and gave them each a hat and a thing to carry while Shannon as Queen B was behind the backdrop gathering her bath stuff. We had our sound effects loaded onto a PowerPoint file, so a click played a short "Fanfare" to announce the Queen's entrance. Shannon showed the kids her bath toys, sang a bit of "Rubber Duckie," and got into the bath. Another click played a "Tub Filling With Water" sound effect, while Shannon flipped on a bubble machine. This looked and sounded good enough that several kids stood up to peek into the tub to see the water. Nothing like an audience with a rich imagination. Then we got into the story. We adjusted the words a bit to make it all dialogue. So "Help, help, said the Page when the sun came up" becomes "Help, help, it's morning and the sun's come up..." I asked the audience to join in with the "Queen Bidgood's in the bathtub and she won't get out!" refrain. Then when I say "Who knows what to do?" we click the Fanfare music again and the Knight/child gets to say his only line: "I do!" Then I fill in the rest, adapting from the book again: "...said the Knight when the sun came up" becomes "It's the Knight! And the sun's come up." And the I say the next line too, to the Queen: "Get out! It's time to battle." That line is said by the Knight in the book, but having the storyteller as Page do more lines and guide the action works well. The kids just have to hit their "I do!" line (and about 3 out of 4 usually do) and look cute. The rhythm of the text is really important to the story, so we tried to hold true to that. The knight goes into the tub, setting up Shannon's line as Queen Bidgood: "Come in, come in, with a boom, boom, boom. (rather than "'Come in,' said the King...") Today, we battle: in the Tub!" 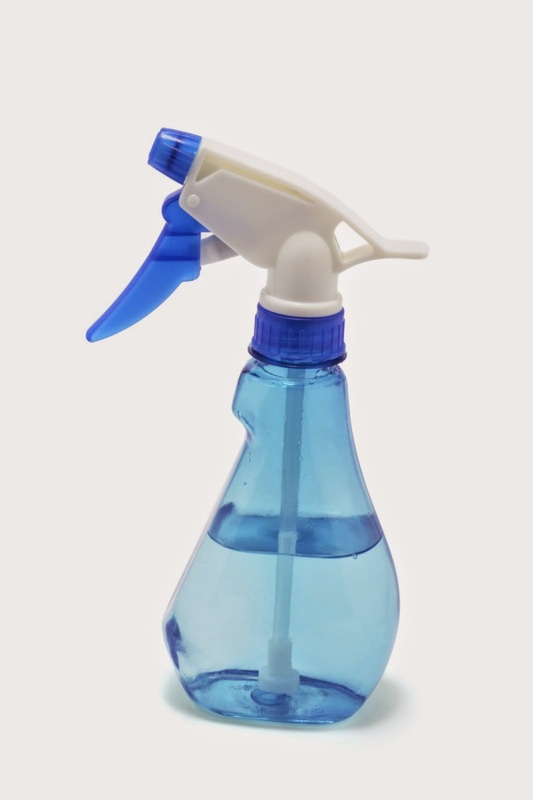 Then Shannon pulls out two fish shaped squirt guns and she and the Knight squirt each other, and the audience. After that, the pattern repeats. We used the same Fanfare sound effect to announce each new person, and that worked well to solidify the pattern. King comes in with a loaf of bread and Queen Bidgood shows corn and grapes (or whatever food props we had in there). Jester brings a net and Queen Bidgood has one two, plus fish puppets she's caught in them. When we planned this I pictured all the kids in the increasingly crowded tub joining in each activity, but that was just a little too much for them to manage, and it was fine to just have the new tub arrival do the actions. With the Princess, it's "Dance in the tub!" and our sound effect is a clip from "The Hustle" by Van McCoy and the Soul City Symphony (summer of '75....seems like only yesterday). For the ending, in which the Page pulls the plug, we added one more sound effect: Tub Draining, and Shannon led all of the kids out of the tub. Although it's a perfect ending on the page, we seemed to need something a little more definitive to close it out. 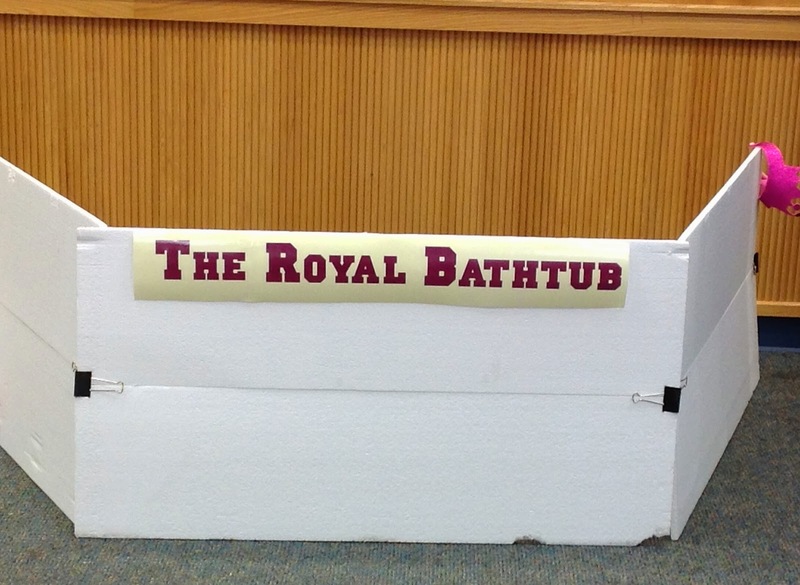 So we tried: And that's the story of Queen Bidgood's in the Bathtub....she finally got out!" In Storm is Coming, a farmer warns the animals that a storm is on the way. They think "Storm" is an actual person, and worry that he will be mean and scary. When lightning, thunder, and other storm elements come, though, they think those will all help them avoid meeting Storm. I have to admit, this is not a book that I would have read and said: Puppet Show!" even though I'm always on the lookout, but Brad and Terri developed this a while ago and worked it out nicely. The pattern of misunderstood weather elements, a cast of farm animals, and a few simple sound and light effects make it work. 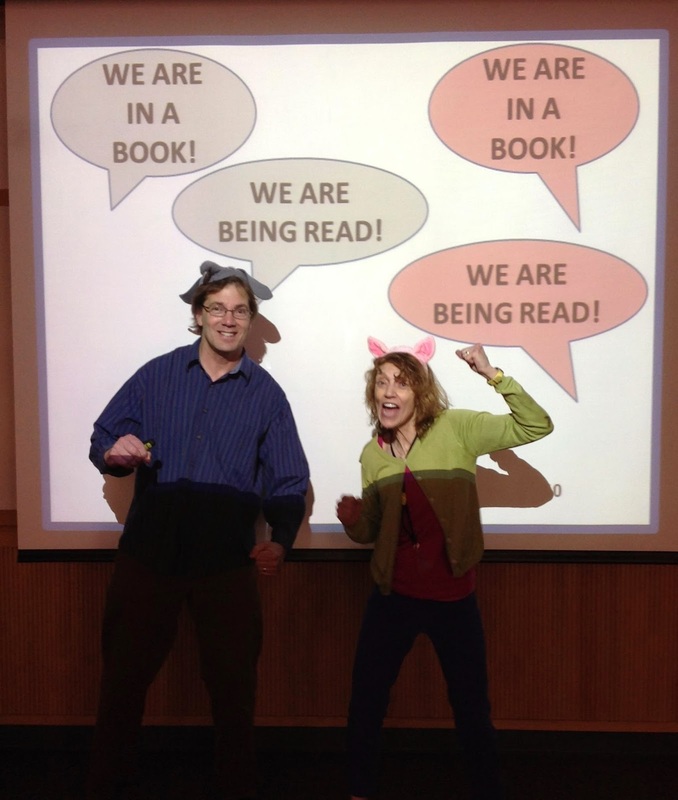 Brad and I did it for Family Storytime a few weeks ago. Brad handled three puppets: Cat, Dog, and Cow, while I was Farmer and Duck, plus managed the weather effects. Farmer is actually just me in front of the stage to start and end the story. He could also be a puppet, but it seemed to work better to have him outside of the space where main story takes place. To manage the three puppets, Brad would sit Cat on stage off and on, since Cat sleeps through most of the storm. We also used a parent volunteer for each session to manage the lights. We picked her out beforehand and gave her a highlighted script so she would know when to switch them. After Farmer warns the animals, Dog sends Duck to look for signs of the storm. Duck goes to the top side of the stage, calls out "No storm! No storm!" and then describes what he does see: "But the sky is getting darker!" The parent then turns off the lights. The kids in the audience know (we hope) that this means the storm is coming and the animals are just confused. But the animals on stage decide that the dark skies will help them hide from Storm. This pattern continues, and if the kids don't get it the first time through, they soon catch on. 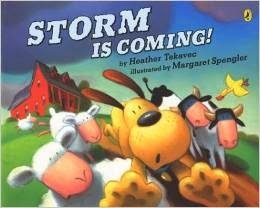 Duck hears thunder; I shake a thunder stick; Dog and Cow are glad that Storm won't be able to hear them. 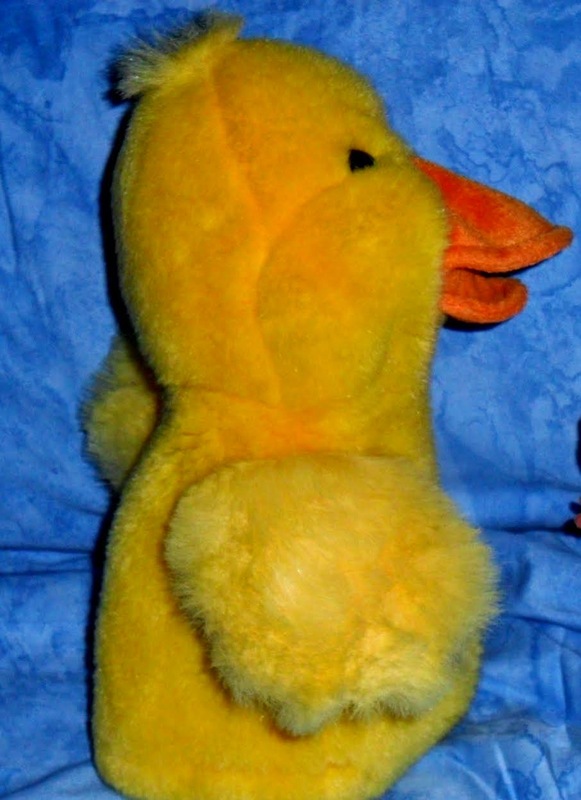 Those misunderstandings continue as Duck sees lightning (parent flashes lights on and off), feels raindrops (I squirt audience with water bottle), and feels wind (blowing/whistling into microphone). Finally Duck sees that it's light again (parent flicks lights back on) and all of the animals conclude that Storm never came at all. 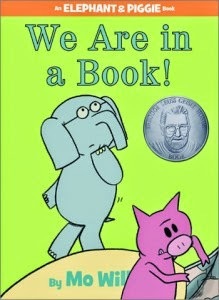 We've done plenty of Mo Willems' Elephant and Piggie stories at our library, both as two-person act-outs and as one-person puppet stories (including I Am Going, I Broke My Trunk, I'm a Frog, Let's Go for a Drive, and Watch Me Throw the Ball). But I always just dismissed my favorite E & P book, We Are in a Book, as not suitable for Storytime. 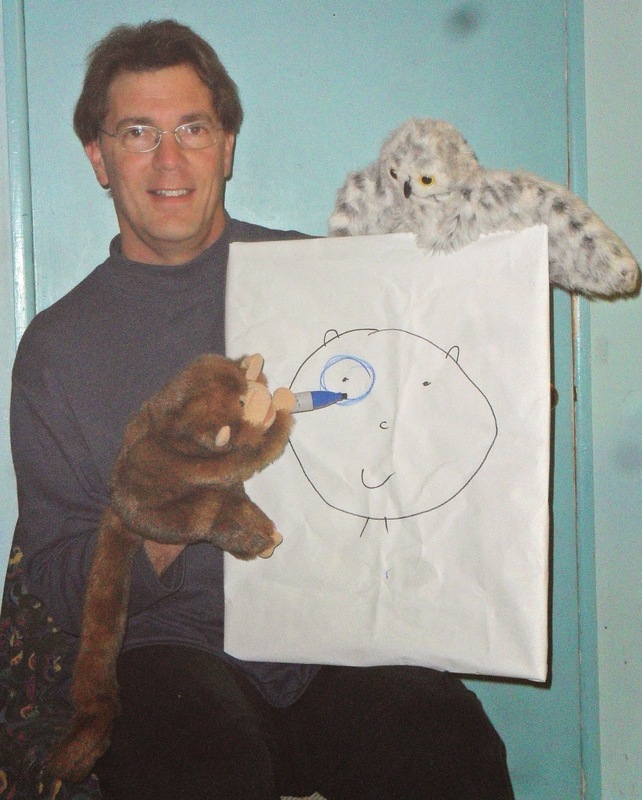 Then I learned that Rick Samuelson of Washington County Cooperative Library System (Rick can be seen in WCCLS's excellent Fingerplay Fun Youtube pages) had adapted it as a stage puppet show (neatly re-titled as "We Are in a Puppet Show"). 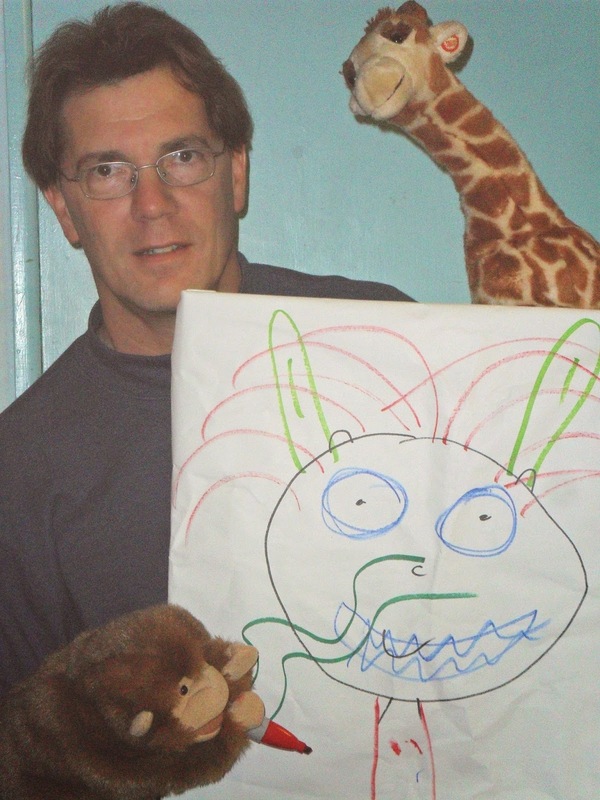 I never got to see Rick's show, but it got me thinking again about the book, and finally Sheila and I got a chance to do it for one of our K-2 Book Adventure programs. Using PowerPoint and our Projector and Screen was the key. We made a series of slides to replicate the book. Each slide has a frame, with a page number down on the bottom right. And clicks make the word bubbles appear. So all we had to do was read from the word bubbles. Which actually isn't that easy, because they're behind you, but a quick glance was all we needed. (Sure, memorizing would have been even better, but sometimes there's just not time for that). 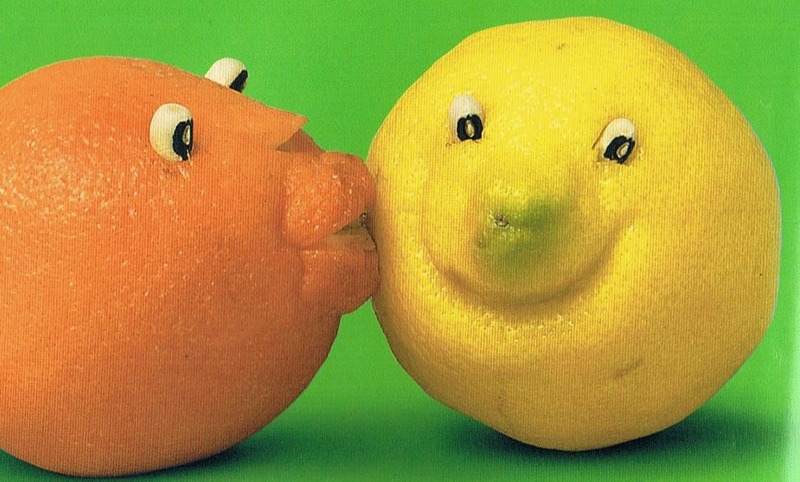 After that, the two have fun by getting the readers to say "banana." This was the one part I wasn't sure would work. 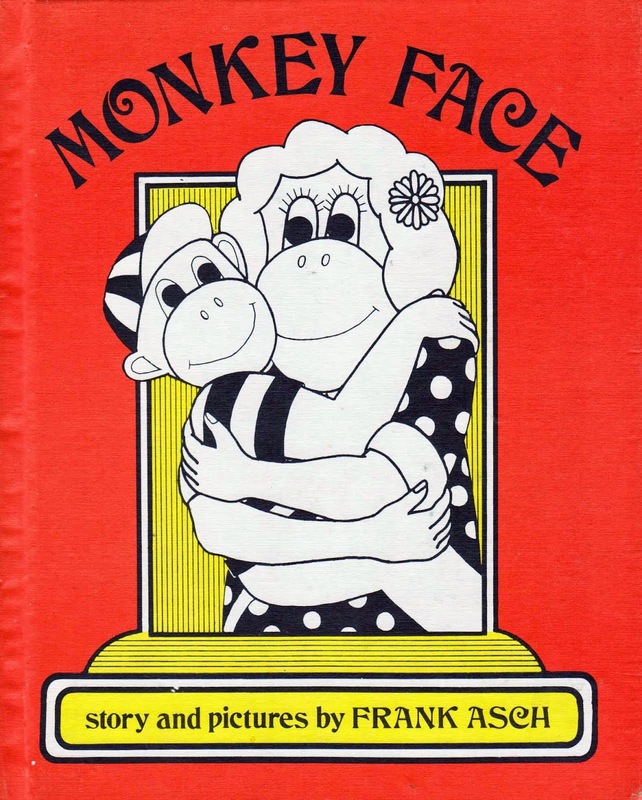 I wondered if the kids would read all of the word bubbles out loud, so that when "banana" appeared on the screen the joke wouldn't work so well. But it was fine. A couple kids were reading aloud most of the way, but when Sheila/Piggie introduced the plan and said "Here I go...," and the word "BANANA" appeared in a word bubble, everyone said it. As Gerald says: "so funny!" Then things take a different meta-turn when Piggie realizes the book will end. 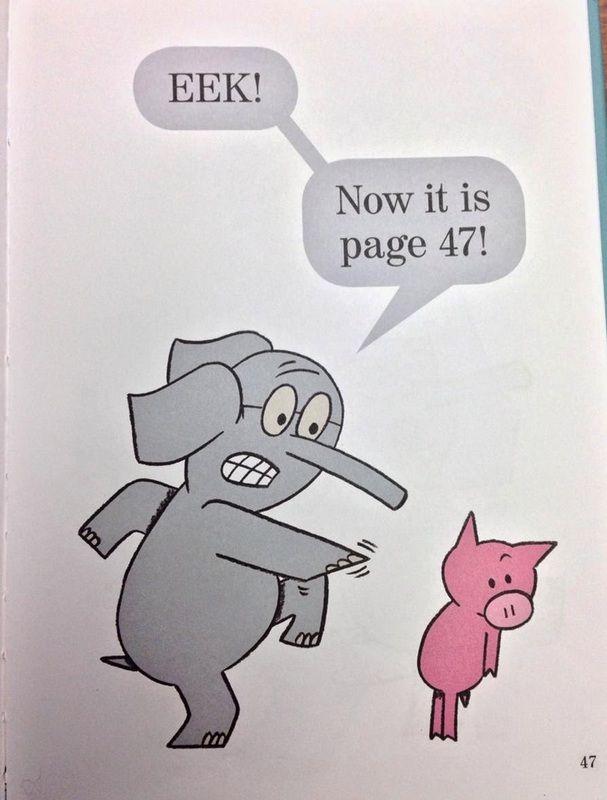 In the book, Piggie appears to peel back the bottom right-hand pages to find out what the last page number is. That worked fine in our version: Sheila peeked behind the bottom corner of the screen, where the page numbers would be if it were a book. 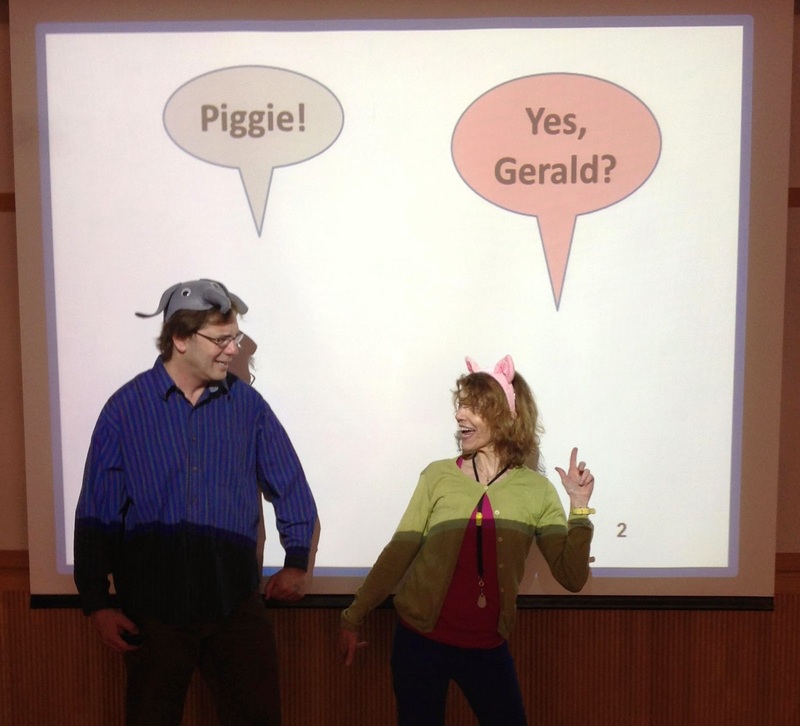 It all finally ends with Piggie's fine idea of having Gerald ask the kids to "read us again." Which fit neatly into our program, since with our K-2 Book Adventure events we always have multiple copies of the books we feature, and the kids really did go check those out. And read them, we hope. The only problem with this way of doing the story is that we couldn't use it when we went out to schools to promote the event, as we do each month. We really needed the word bubbles and mock-page for this one. 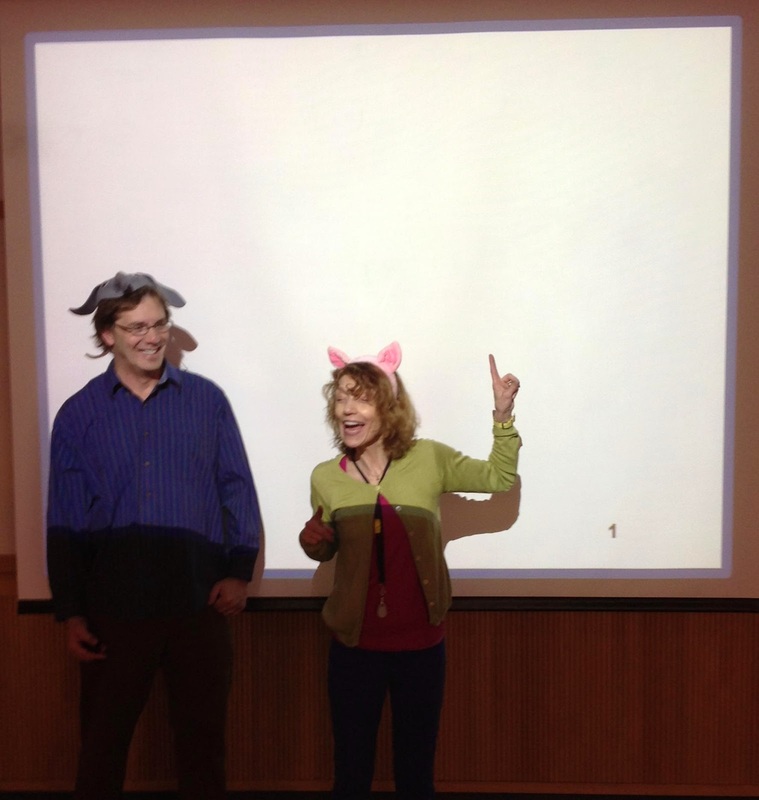 No problem, though: we just substituted another E & P: I'm a Frog, and you don't need anything for that (though pig ears and elephant hat do help). As for We Are in a Book, in the Slate Book Review, David Plotz says that this book "is arguably the most disturbing book published in America since The Road." Sheila and I talked about it, though, and we decided that it's challenging enough to adapt Mo Willems....we'll pass on Cormac McCarthy for now. 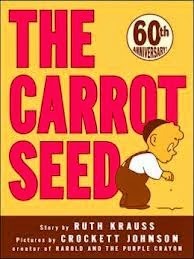 Sheila, Brad, and Terri have all done The Carrot Seed since it was developed in a very cool way (by Sheila and Brad) a few years ago. None of the stories we've done is anything quite like this. It's always been one of my favorites to watch, but I haven't written about it on this blog partly because it's easier to write when you've done it, not just watched it, but mostly because I really just couldn't figure out to describe it with words and pictures. So we filmed it this time, and I'm hoping watching the video clip below will make sense along this written description. It started when Sheila found this old recording of the book on the web from 1950, narrated by Norman Rose (a classic voice, whose roles included "Death" in Woody Allen's Love and Death and the Juan Valdez Columbian Coffee Commercials). Brad downloaded the recording from the web, then edited it a bit. 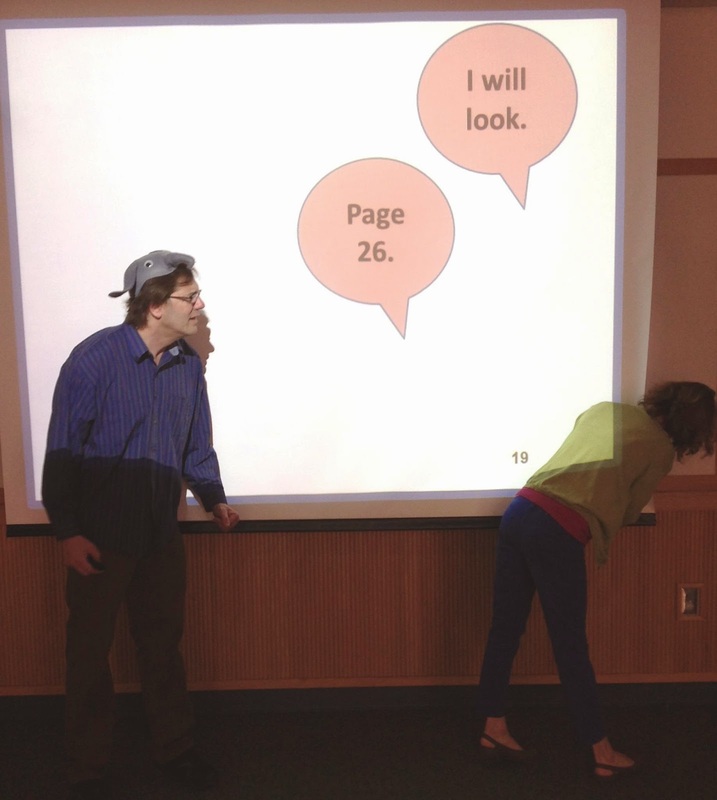 Then we act it out, kind of mock-lip-synching to the narration. In our recent Family Storytime, I was the Little Boy, wearing a beanie and standing on my knees (it's hard to pull of Little Boy when you're 6' 3"). 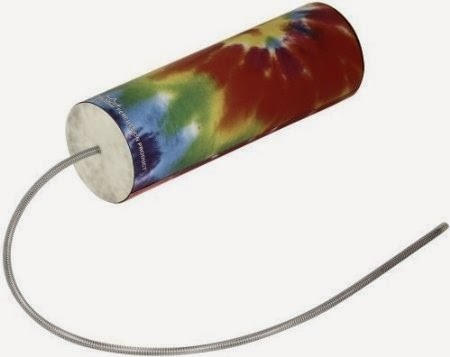 We covered a wooden cart with brown butcher paper for the garden and put our big carrot and a flibber inside (see below for flibber details). It's pretty funny when I mouth along to the Little Boy's songs. But then Brad comes out, first as the Mother, with an apron on, and we hear the Mother's high, old-fashioned singing voice coming from him, and it's really funny. He quickly changes props to become Father, then switches again and hops on a scooter to portray the Brother. In between each of these, the Little Boy sings that catchy little song. When the carrot finally comes up, I reach into the box to pull out the flibber, which grows and kind of "blossoms" as you pull it apart. Flibbers don't always work perfectly, but usually well enough. I hold the end of the flibber to the top of the stuffed carrot to make an impressively sized carrot. About Flibbers: Sheila kindly constructed our flibber, which I learned to make from Robert Lopshire's excellent How to Make Flibbers, Etc. : A Book of Things to Make and Do. The book is long out of print but the flibber instructions from it are here. 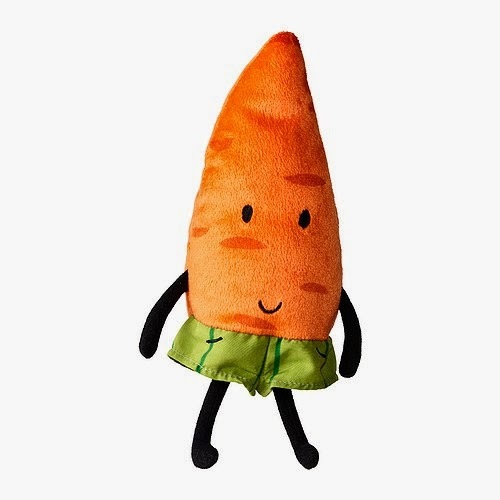 About Big Stuffed Vegetables: The stuffed carrot is one we got at Ikea...they also have broccoli and strawberry and we seem to use all three pretty regularly. You never know when you'll need a big stuffed vegetable. 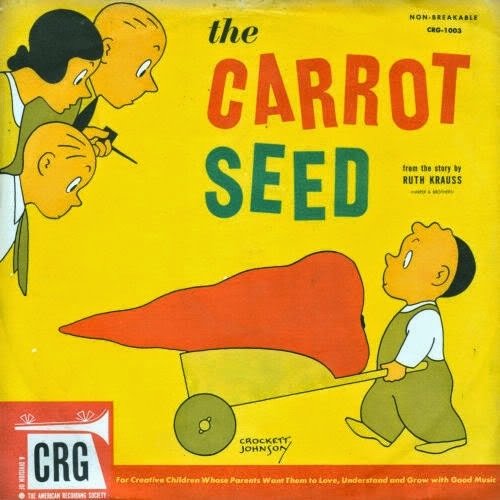 About Old Children's Records: The Carrot Seed also appears on a very cool website called "Kiddie Records Weekly," which has dozens of recordings from "the Golden Age of Children's Records" which was in the 40's and 50's. 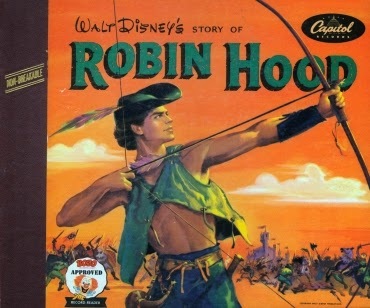 You can stream or download The Pied Piper of Hamelin narrated by Ingrid Bergman, Gene Kelley doing The Little Red Hen, and a Disney recording of "Robin Hood," that I think might be the exact same one that I had as a kid (though we had 33's, not 78's...I'm not that old). Not that I think we'll use more of these in Storytime or anything, but it's a pretty interesting site, especially if you grew up listening to stories on records as I was lucky enough to get to do (thanks, Mom).